You can buy the best, most expensive makeup in the world but if you are applying it with crap brushes, your pricey makeup is going to look like crap too! 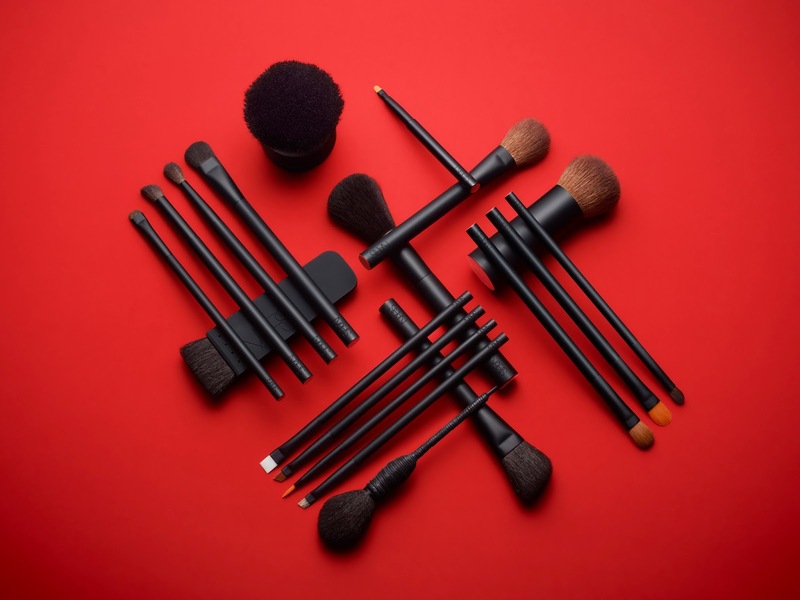 No worries since NARS Cosmetics has just released a brand new 16 piece Artistry Brush Collection that look as good as they work. Each brush is designed with the finest quality hairs and delicately weighted to provide the necessary balance for a professional and precise makeup application. The custom brush and packaging feature the iconic matte black finish with sharp debossed logo and signature pop of red on the end. FACE CATEGORY - Refine. Blend. Conceal. Powder Brush #10 - $58 - blends, buffs, and diffuses loose powder for a lustrous finish. Double domed with layers of full, soft hair to pick up and deposit powder evenly. Bronzing Powder Brush #11 - $58 - an artist essential for controlled application. The dense concentration of soft, natural hair holds and applies product for an even, all-over glow. Cream Blending Brush #12 - $32 - a versatile, multi-use brush for face and eyes. Designed for gentle application of concealer around the eyes and effortless blending of cream textures. Precision Blending Brush #13 - $30 - for precision application of concealer. Ideal for focused use on spots, pigmented areas, or around the eyes and nose. CHEEK CATEGORY - Sculpt. Contour. Highlight. Blush Brush #20 - $47 - professional domed shape deposits blush pigments perfectly. Diffuses as it blends for smooth, effortless application. Contour Brush #21 - $47 - expertly angled for sculpting and highlighting the cheekbones. An artist essential to define and blend with controlled application. EYE CATEGORY - Line. Define. Blend. Eye Shadow Brush #40 - $36 - deposits the perfect amount of pigment for a masterful sweep of all-over shadow. Diffusing Brush #41 - $37 - a must-have for blending and creating the smoky eye. Lush bristles softly apply shadow for a light veil of color. Blending Eye Shadow Brush #42 - $37 - ideal tool for applying high-shimmer shadows and effortless blending for a soft-focus effect due to softer, longer hair design. Wide Contour Eye Shadow Brush #43 - $37 - the go-to artist essential that does it all: tap, blend, or sweep shadow with ease. Angled shape allows for all-over or precise application. Precision Contour Brush #44 - $32 - the firm, flexible hair design of this brush is ideal for applying concentrated color in the eye crease. Smudge Brush #45 - $32 - the smoky eye artist essential. Expertly deposits colour along the lash line and diffuses and softens eyeliner. Push Eyeliner #46 - $32 - transforms any cream or powder eye shadow into an eyeliner for a smooth, fine line at the base of the lashes. Use wet to apply powders for stronger colour impact. Angled Eyeliner Brush #47 - $32 - designed for impeccable glide when applying liquid and cream textures along the lash line. Perfect for use with NARS Eye Paint to create a variety of effects, from natural to dramatic. Brow Defining Brush #48 - $30 - define, shape and fill in sparse brows. Firm bristles provide control and deposit powder for a hair-like effect. Precision Lip Brush #30 - $30 - designed with a wide, flat surface to evenly apply lipstick with precision. I have to say, it's a classy looking brush line! My fave is the blush brush, it's the perfect size for the "apple cheek" application method I prefer and the brush is nice and soft so it picks up just the right amount of product. My only complaint would be that although I love the matte black handles, be sure your hands aren't greasy when you use them or the matte finish gets all smudged up - luckily they're easier to clean off then the black casing on the NARS palettes are! Available now at select NARS retailers including Sephora, Hudson’s Bay, Holt Renfrew and Murale as well as online at: www.narscosmetics.ca. I plan to purchase the #40 eyeshadow brush. I always need new brushes for my vast shadow collection.